Why are politicians telling us the system is running out of funds? Young workers and retirees in San Jose look at the facts behind the hype. 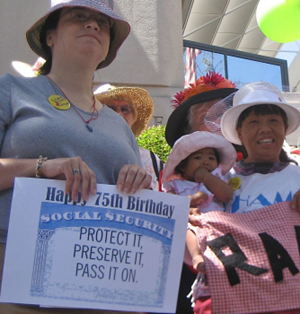 While President Obama's deficit reduction commission is proposing to reduce payments, raise the retirement age or put the funds in the stock market, there's a much fairer, simpler solution to the long-term health of Social Security - raise the cap on payroll deductions. The bottom line is - Social Security is a fund separate from the general fund and is not responsible for the federal deficit. Perhaps you have some ideas as to what's draining nearly half of the U.S. budget. Join the conversation on YouTube/48south7th. Resources and local contact information to come.